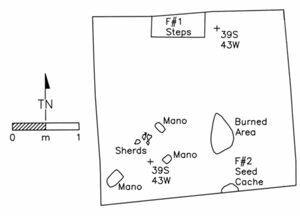 Room 4B measures 3.3 x 2.9 m. Four stratigraphic units were identified in the room including two post-occupational layers and a floor sequence associated with the San Juan occupation. Room 4B has three associated features -- two are door-related and one was a seed cache containing burned corn and ash. The room was used for storage and food preparation. Other uses could have included living or sleeping.